There is a path in the town where I live in Beit Shemesh, Israel that runs quite a long way. This time of year it is very pretty with lots of blooming, particularly almond blossoms. I was inspired while strolling there and decided to work something up with that path in mind. This is still a work in progress, but it’s a nice beginning, I think. 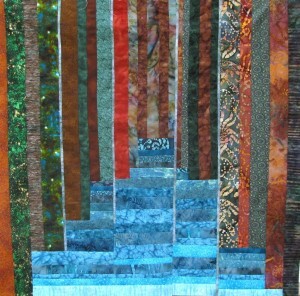 I am thinking about how to best quilt it: maybe cobblestones? maybe ridges? I’m not sure. Also I’ve asked my friend Phyllis Cullen what she thinks about the shadows on the path. In a class I took with Phyllis last year, I remember she said the bottom of the path should be darker than the top so the path doesn’t appear to stand up. More to come! Meanwhile, what do you think? 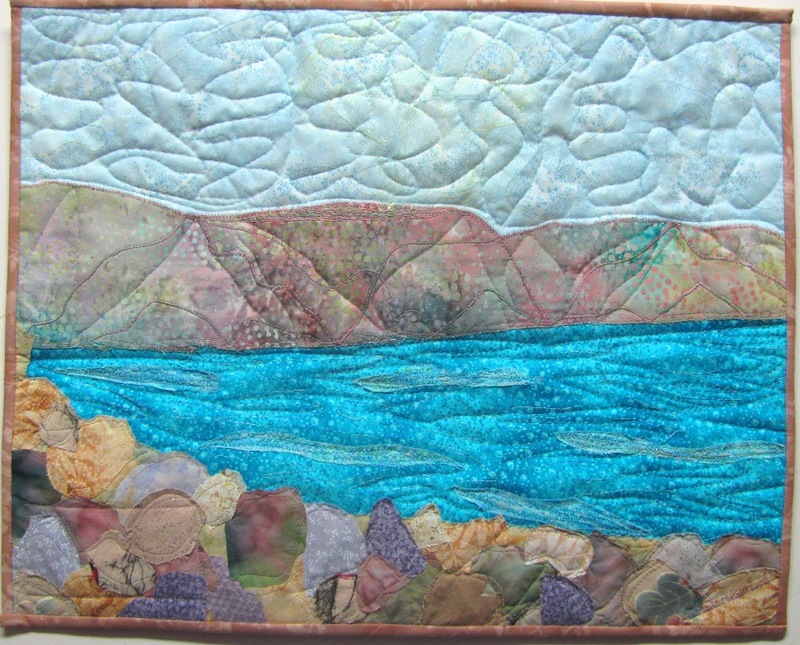 Scenes from the Holy Land: Sea of Galilee is my rendition of the shores of lake Kinneret, located in the Galilee in Northern Israel. The Sea of Galilee is our main source of water and due to a severe drought water levels have been a great concern over the past few years. This is the first of a series of Kinneret quilts I am planning. 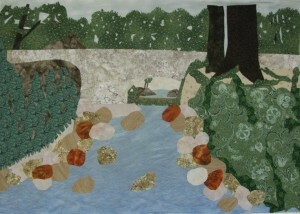 I think this part of the country is beautiful and I have tried to convey this in my quilt. I hope you too can appreciate the countryside by peering into the waters of my work. 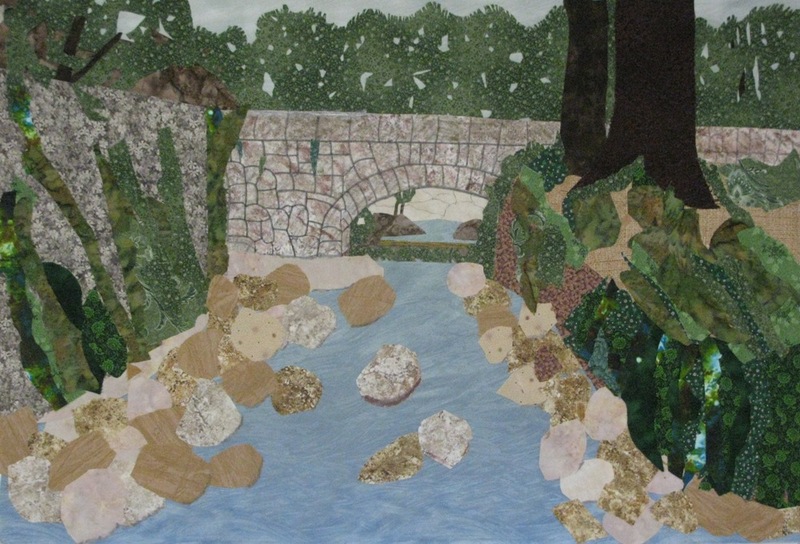 I used numerous fabrics to depict the rocks and mountains. Available at my Etsy shop. Visit soon! 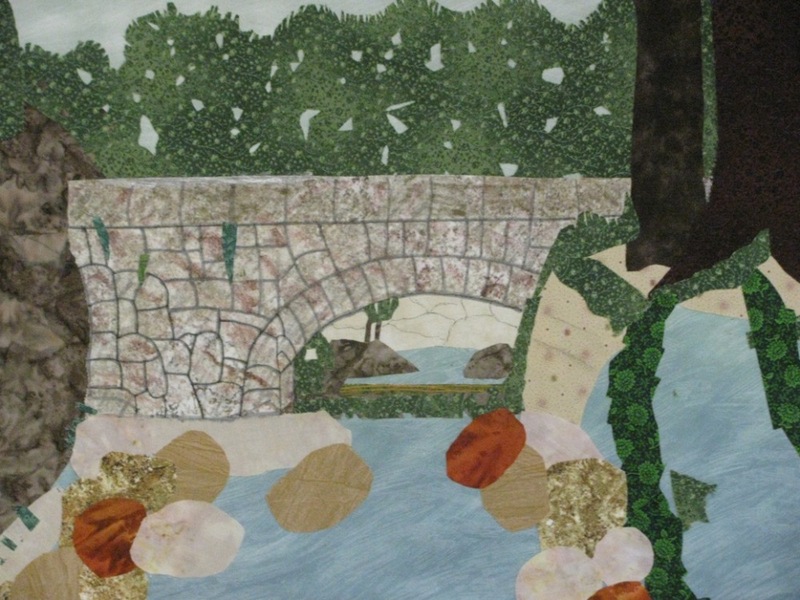 I visited Northern Israel over Sukkot and was inspired by scenes around the Jordan River. The view was breathtaking. I decided to create one of the scenes in fabric. It’s an impressionistic rendering, but I think you will agree you can wade through the water to the edge of the trees. 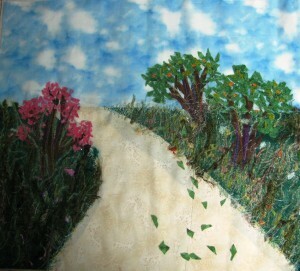 I used cotton fabric to create this quilt art. The batting is cotton as well. If you are interested in purchasing it, contact me here or via my Etsy shop, where you will see other pieces of mine that are also up for sale. Here is a photo of “By the Lake”. I needed a break from the landscape project, so I worked with fall-color maple leaves and made a mini-wall hanging. I also made a watercolor challah cover in the meantime. 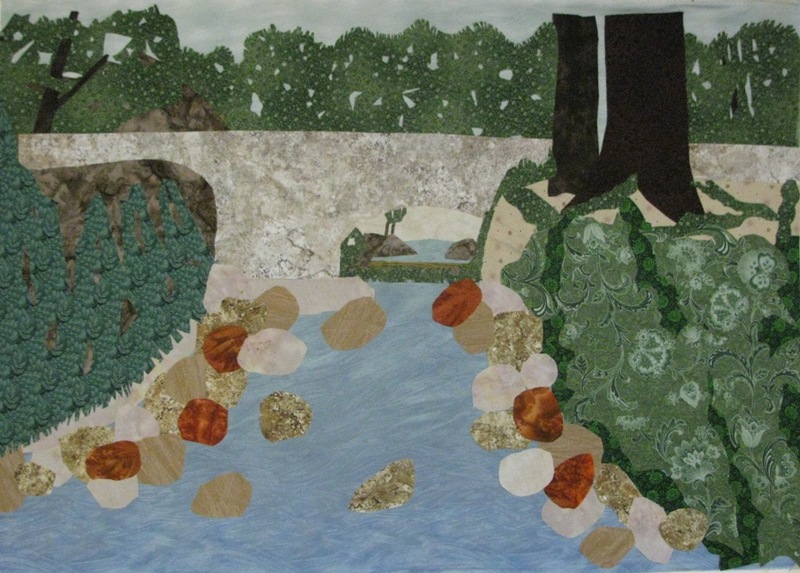 I have finally reached a point where the basis for this landscape art quilt is done. The design is my interpretation of the photo. I think you can see the two banks connected by a bridge. That’s what I was going for. 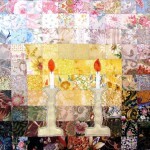 The images are appliqued. The overall look will still change a lot once I start thread painting using free motion machine quilting techniques. 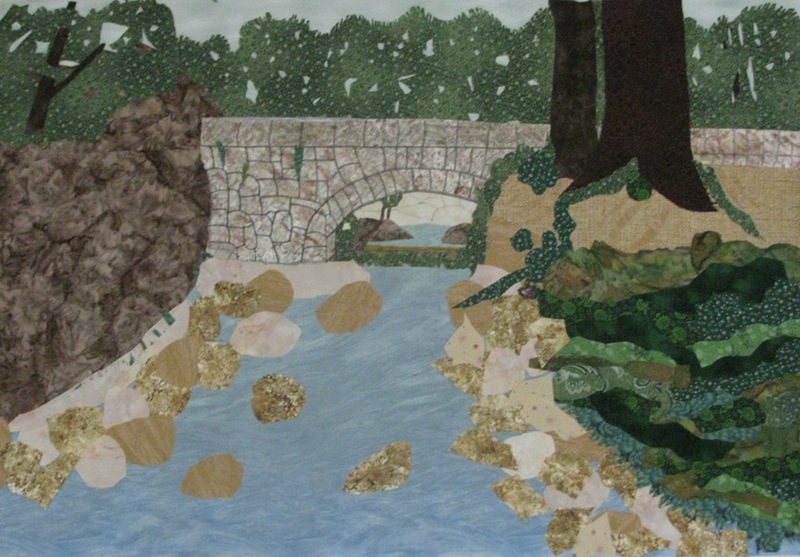 Landscape art quilt, continued, and continued. Are you bored yet? I had a great time at the fabric shop finding the right fabrics for my stone walls. It always energizes to visit the shop and be surrounded by beautiful fabrics. It’s like a candy store! This project has been an education in proportion and perspective. The land and slopes are now in place. I need to add the foliage.If I did it right, you can sense the 3D quality. I really like the effect under the bridge. It looks like another land I would like to visit. Whew. This has been a real challenge. 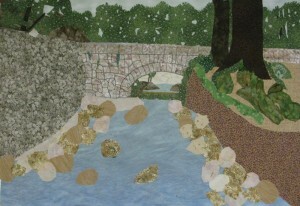 I worked intensively on the right side of the river and this is what I have come up with. The method I used is called collage. I allowed a play between dark and light greens to give the feel of a hillside. I’d be glad to hear what you think. Is it too busy? I think I like it. I need to leave it and come back to it. 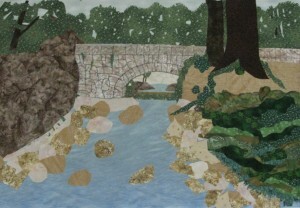 This morning I decided the flatness of the sides and the bridge rendered the quilt ineffective. So, back to the drawing board. I worked on the lightness:darkness ratio, (known as color value), on the bridge. 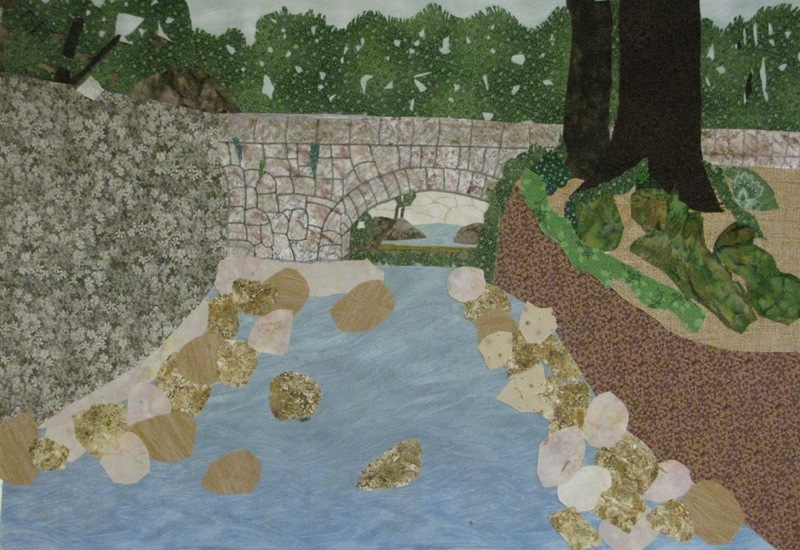 I didn’t even tackle the sides of the river though I did remove them… So here is the current rendition. Sometimes if you take a break from a project, you may realize you do not like parts of it. You can always shift things around and rework them. Don’t give up. Look at the next iteration as a lesson learned. I say this as much for myself as for anyone who may be reading this blog. I have laid out the elements in the scene using cotton fabric. It still looks very 2-dimensional because I haven’t added any embellishment or quilting yet. 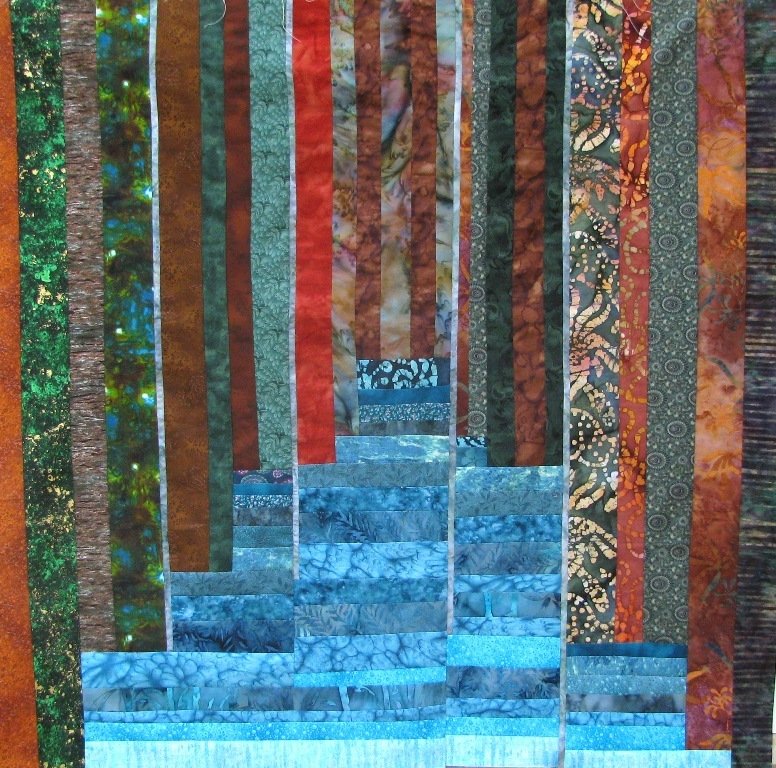 The quilting will bring out the depth in the piece. 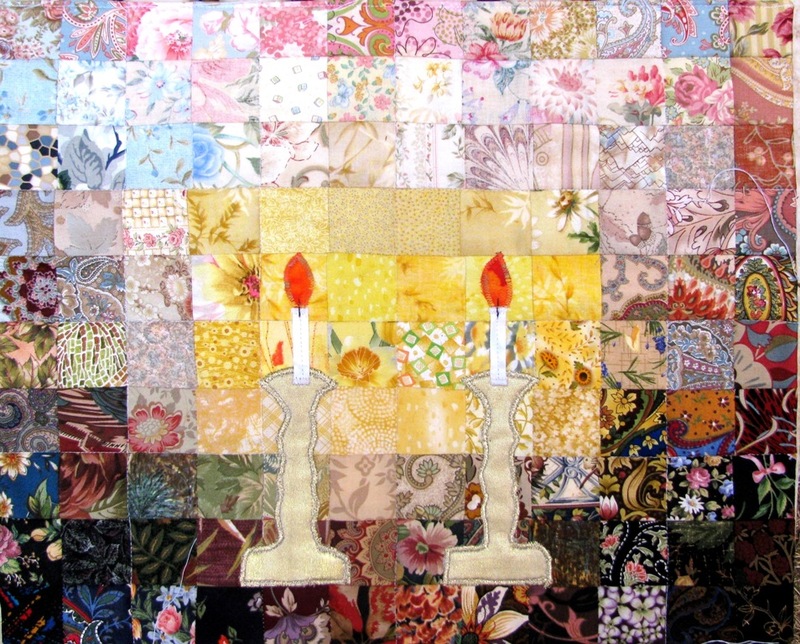 I will embellish with textiles, such as silk, lace, yarn, tulle and bits of colorful fibers. For now you can make out the basic scene. Compare it to the photo upon which this work is based.